This is one of 600 images from the Braikenridge Collection that can be viewed on Know Your Place. The collection of early nineteenth century images is held at the Bristol Museum and Art Gallery and although many of them have appeared in books over the years, because of their fragile nature the original pictures are rarely seen by the public. The watercolour pictures were originally commissioned from a number of local artists by George Braikenridge, a collector and antiquarian living in Brislington. The Braikenridge collection consists of 1400 watercolours and is an invaluable resource for Bristol because they accurately depict parts of the city before the advent of photography when it still had a decidedly medieval character. In many instances the images convey scenes of daily life in the pre-modern, pre-mechanised urban environment. In the 1990s John Bryant of Bristol and Region Archaeological Services and the late Jon Brett, City Council Archaeological Officer, worked with Sheena Stoddard, curator of fine art at Bristol Museum and Art Gallery, to accurately plot the locations of these images using the 1828 Plumley and Ashmead map of Bristol that appears on Know Your Place. This work was funded by English Heritage to help enhance the Bristol Historic Environment Record along with similar analysis of other archive collections such as the early 20th century drawings by Samuel Loxton held at Bristol Reference Library and the Bristol Municipal Charities Collection of 1906 photographs held at the Bristol Record Office. I find the images in the Braikenridge Collection fascinating, but in many cases they require putting into context to fully appreciate the story that they show. The fact that you can view the image in association with a map of an equivalent date on Know Your Place helps to provide an understanding of the history shown in a picture, but when you use the additional layers on the site further information can be revealed. One of my favourites is this watercolour from 1821 by Hugh O’Neill. The image particularly grabs me because I immediately want to know why two horses are being ridden through the water, what the fence was for and where was this building? It turns out the view is looking west along what was Narrow Weir at the ‘watering place’. This is part of the River Frome close to where it joined the castle ditch or moat, although the water courses are complex in this area because they include the river, castle ditch and mill race for the Castle Mill. 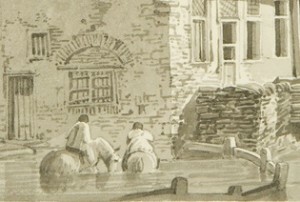 The watering place was mentioned several times by William Worcestre in his travels around Bristol in 1481 in which he describes “The Weir, on the other side of the road, where the horses of Bristol are usually watered…” (William Worcestre: The Topography of Medieval Bristol, ed Frances Neale, Bristol Record Society, 2000). 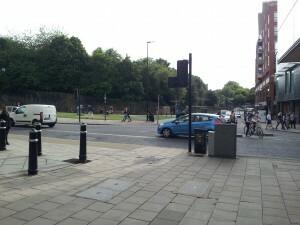 The horses could enter the water from a slope, just visible to the left of the main building, that led down from Elbroad Street. The post-and-rail fence in the water was intended to prevent horses from straying too far into the river. The bridge visible to the right of the building is the Ellbroad Street Bridge or Ell’s Bridge that stood at the junction of Narrow Weir, Philadelphia Street, Broad Weir and Ellbroad Street. The painting is a lovely example of everyday life in 1820s Bristol and probably a scene that could have been from any time over the previous 4 or 500 years. 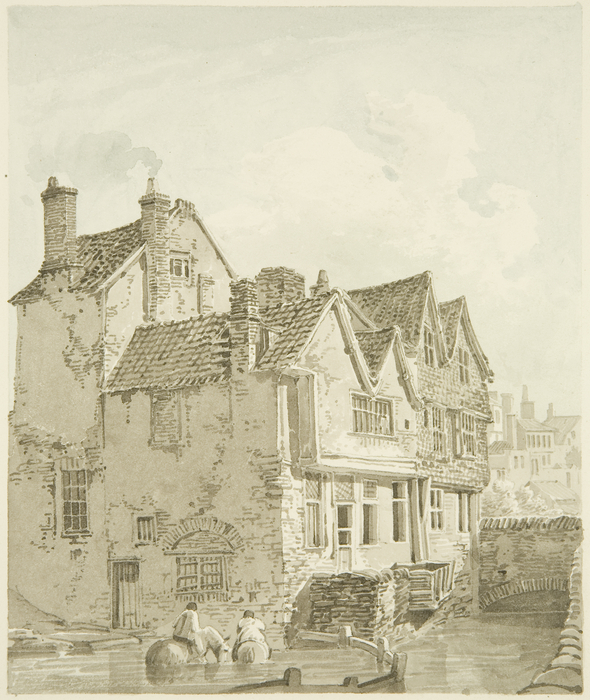 The big timber framed building shown in the painting was demolished in 1900/01 for road widening as described by J E Pritchard in the Bristol Archaeological Notes for 1901 (Transactions of the Bristol and Gloucestershire Archaeological Society, vol 24, pp 281). The site is now dramatically different being beside Cabot Circus and over shadowed by the 70s office tower block of Castlemead and there is no hint of this tranquil scene today. All the historic information is available to view on the Braikenridge drawings, Archaeology reports or Monuments layers on Know Your Place. If you have found a ‘Hidden Gem’ of your own on Know Your Place and would like to guest blog about it, please let us know.